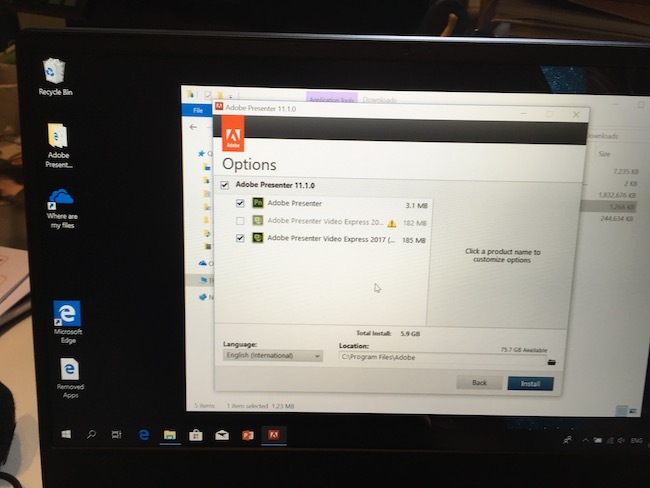 Adobe Presenter 11.1: installation shouldn't be this hard! I've been working on a project using Adobe Presenter 11.1. This is a good solution for companies that already have a lot of material in PowerPoint, and have started to introduce more engaging eLearning but are trying to keep things practical and useful for their teams so that managers create training that works for their people rather than involving complex authoring by external consultants. Being a Mac person mainly, I'm used to stuff just working. But Presenter only works with Windows PowerPoint. It does have lots of nice features that make it easy to add quizzes, extra information and interactivity to existing PowerPoint content so I went off and got a new, though inexpensive, Windows laptop for the project. Nope, they still haven't got Windows installation down to anything approaching acceptable. By the time you've downloaded umpteen updates, that's at least 6 hours of intermittent time just to get to the desktop. Then to my horror, "error 6" when I attempted to install the trial version of Adobe Presenter 11.1! 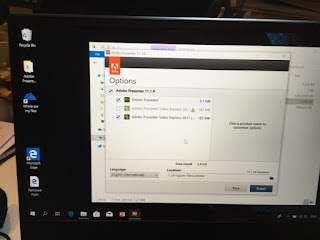 Although Adobe Support's EU opening hours are pretty limited, I did manage to catch up with a great advisor who helped me through remote screen-sharing, plus I found answers from forums... After a further expenditure of about 8 hours of my time, here's what worked, just in case it helps someone else. Obviously you follow these steps at your own risk - and of course, you should back up your data first. Turn off Microsoft OneDrive as this seems to interfere with the location of the Adobe installation files. Or at least it did on the Lenovo I bought. Redownload Office 365, then turn off Powerpoint automatic updates (Start powerpoint with a right click>more>run as administrator, then file>account>update options). If a dialog box pops up click Online Repair (it may or may not pop up). 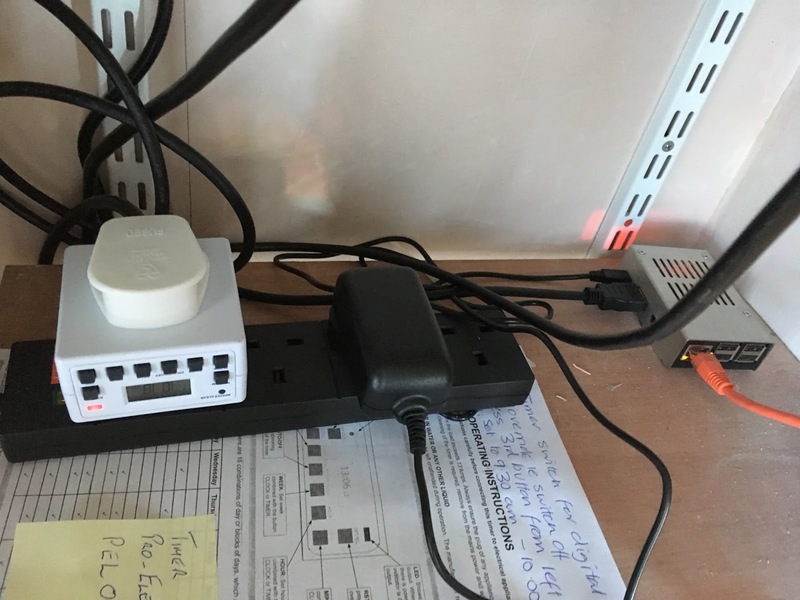 The repair process take 10-15 minutes depending upon the network connection. Check that automatic updates for Office haven't turned themselves on again. Download and run this: https://gallery.technet.microsoft.com/scriptcenter/Registry-keys-to-reenable-7cd9f723 to ensure that Flash update is allowed by Windows registry. Run Powerpoint as an administrator - now you should see the Presenter add-in showing up within Powerpoint and it should work! 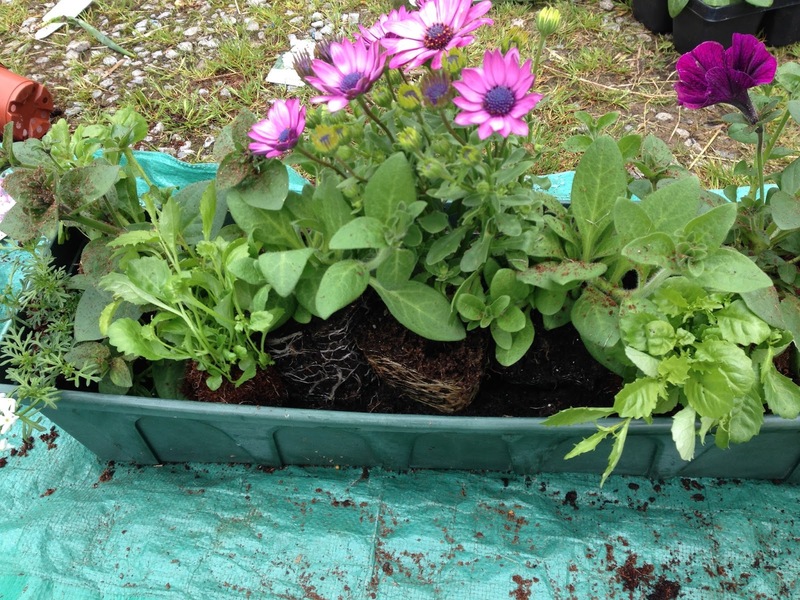 This is my method for window box planting, perfected over many years, with "how-to" pictures. 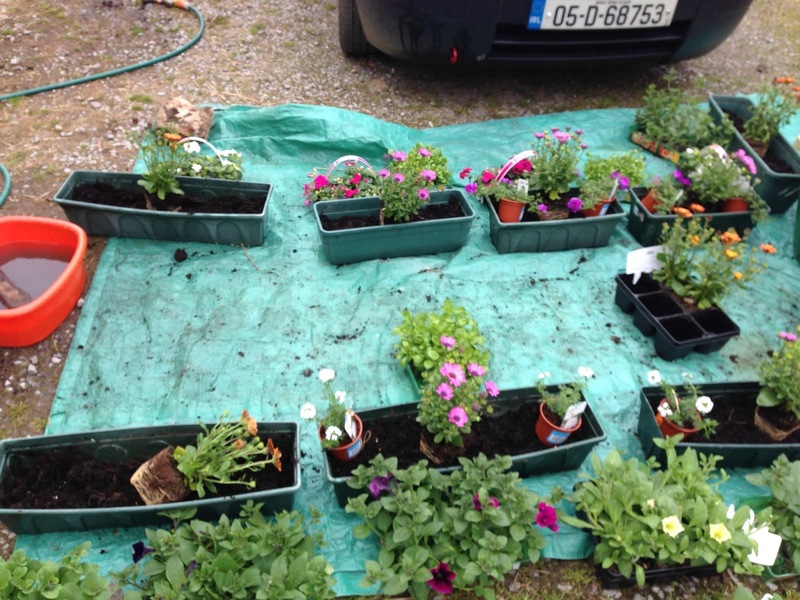 To save money on plants, I often buy smaller ones in April, but keep them in the greenhouse until the last frosts are over around May 15th. B&Q is usually best value and range, but I also use Woodies, Dairygold, Hanleys and Kiernan's, as well as The Pavilion. 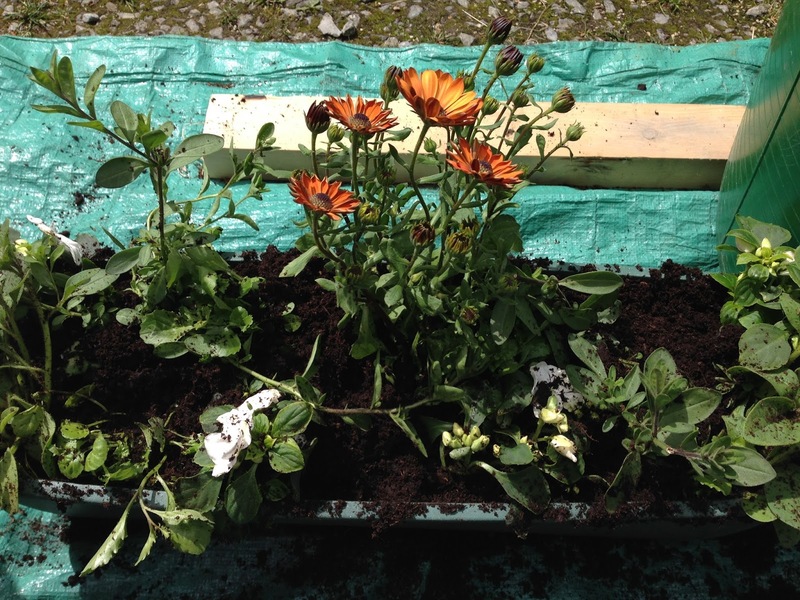 This is to avoid diseases and pests from last year and make them look nicer on the outside. 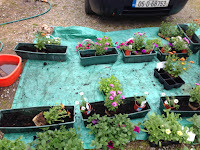 When you've washed them, lay them on the tarpaulin the way that the windows on your house are arranged so that you don't forget which colours will be next to which, or where you might have a shadier window that needs different plants. You need to put crocks over the drainage holes. Wait, did I forget to mention, check that your window boxes actually have drainage holes? Some cheaper ones do not. You can get someone good at DIY to drill holes if needed, otherwise your plants will drown. 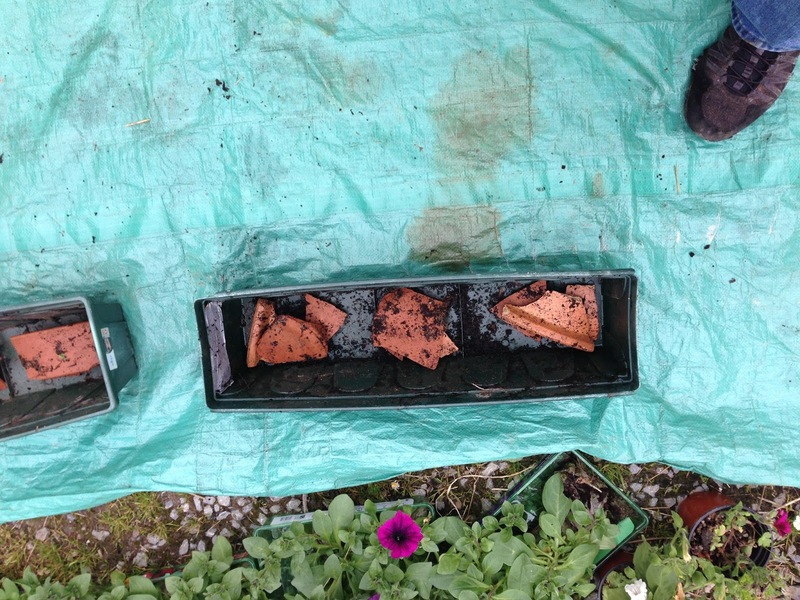 If you don't use curved bits of old broken pots and plates over the holes, roots will block them and... your plants will drown. 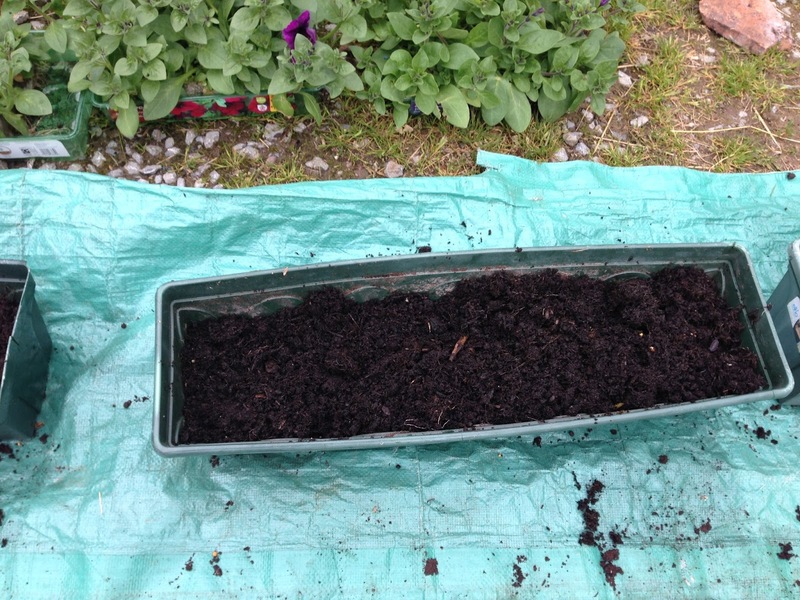 For the bottom of the pots, I usually use a mixture of organic farmyard manure and topsoil. 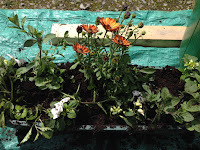 If you only use compost, when it's dry your plants will not get enough water, and also the boxes may not have enough weight to be stable on your window sill in a gale. 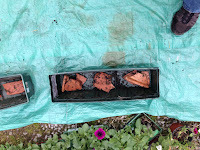 I find that if you want your window boxes to last, you need to add water crystals to ensure the plants stay moist, and also osmocote slow-release fertiliser. 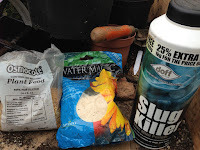 Slug pellets to dress the tops of the soil after planting are also important. 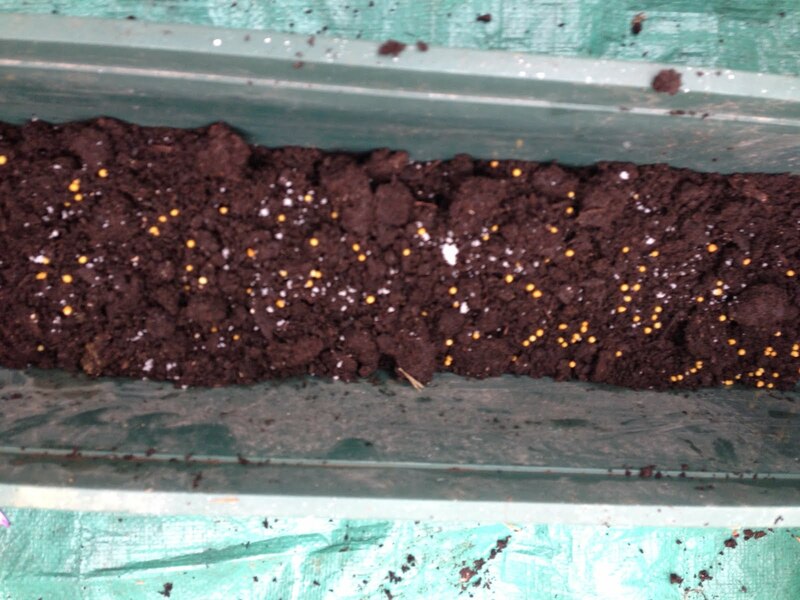 There is at trade-off between environmental damage caused by effective chemical slug pellets, and loss of plants to slugs if you go a more "organic" but less effective route. Each to their own on that debate! 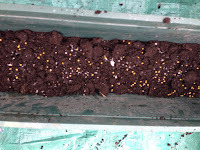 I add the fertiliser and water crystals to the topsoil/manure layer before planting. Just get all the plants out and lay them roughly in position, thinking about colour, which windows get most sun, and which side of the box is the "front" where you will put the trailing plants. Move them around until you are "least dissatisfied". It will never be perfect. 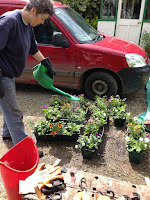 I use surfinias, fuchsias, osteospermums, trailing lobelia, verbenas and I'm fond of good old reliable yellow bidens too. Some plants these days are raised in "tea bags", small individual paper mesh containers of compost. These need to be removed carefully before planting. 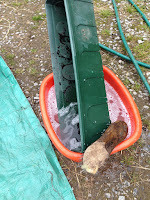 I like to then soak every plant's roots briefly in a bucket of clean water before planting. 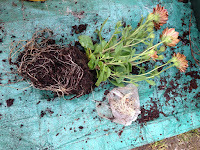 Gently loosen the plant's roots before placing it into the box. The next bit is messy. 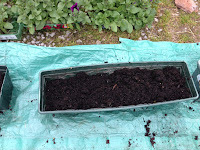 Shovel in the potting compost, firming it around the roots and making sure there are no "holes". 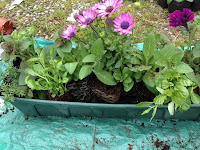 I usually push the trailing plants like lobelia in last of all, directly into the potting compost. At this point your boxes probably look awful and you think you did it wrong. Don't worry. They just need watering. Once you spray off the boxes ,all will be well. 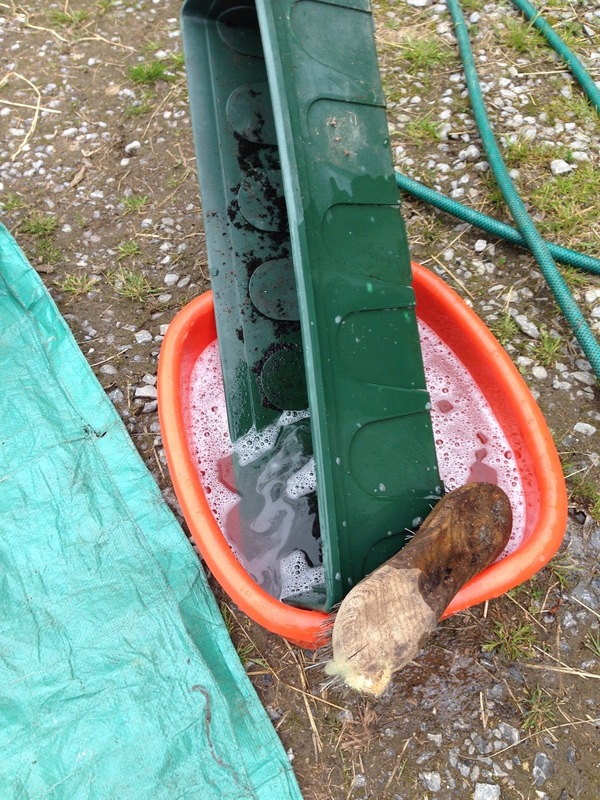 I usually use a watering can from the top followed by spraying the sides of the boxes with a hose. Don't use too forceful a jet. Test the hose first - I find a gentle spray with a circumference of about 6 inches works well. 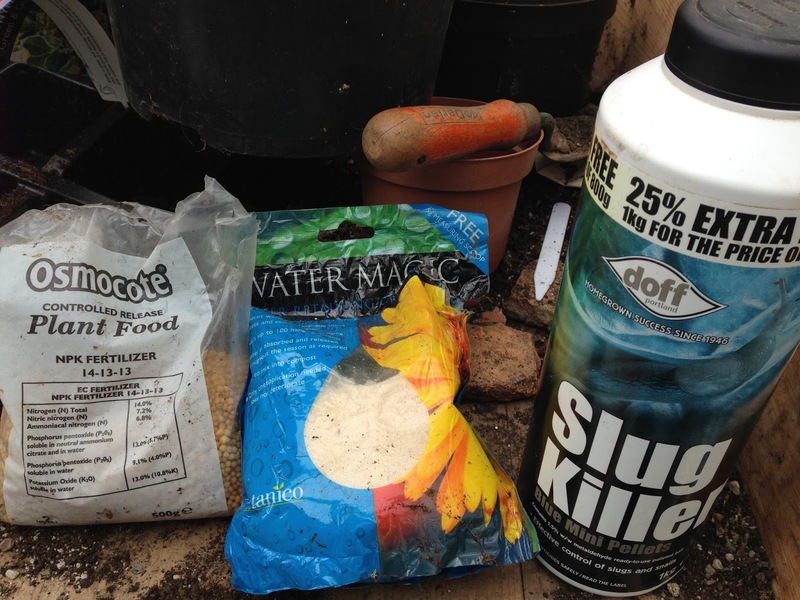 After watering, sprinkle on the slug pellets or other slug and snail prevention. Now they are ready to go to their final location. 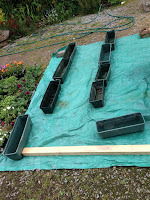 If it is a damp summer, I use old bits of floor tile to raise up the window boxes just a small amount to assist in drainage. Retrospective edit 2016: after EDCMOOC, I did an absolutely fantastic Statistics MOOC run by Princeton which I completed with test scores of over 95% as well as completing OcTEL. if you want an example of how to do a MOOC right, try those ones. You were disappointed by the edcmooc – in what ways did it fail to reach your expectations? The content did not match the title or course description. There was too much video content. The navigation was poor. The time estimate per week was heavily underestimated. What was the best thing about your Mooc experience? Contact with others via my own blog and MOOC discussions. Did you involve yourself with your Mooc’s community or study independently? What would you change about your MOOC? Improve the yield of completion - use the technology currently in place in the IT industry around tracking helpdesk requests and supply chain issues to improve "picking up where you left off" (progress), improve general user experience and website navigation, use analytics to spot how people are contributing and where problems may lie. 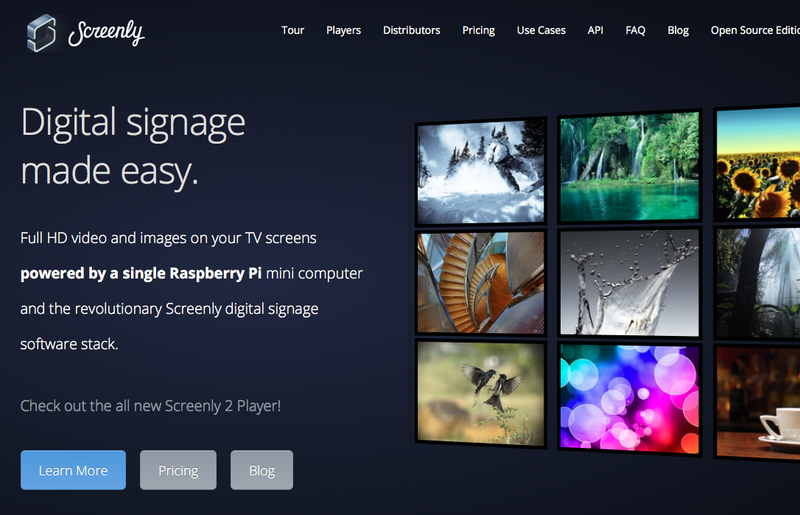 Signal core content in a more obvious way. Make the assessment methods clearer in the course description so people don't sign up without understanding what they are committing to. Do not rely on a lot of video content as it is hard to complete for time-pressed learners. Great project, all kudos to Edinburgh for trying it. 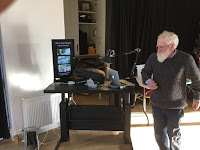 But the overall effect for me was knowing that I don't want to do an elearning course they run that I had previously been interested in taking. I think that's a good thing, for me and for them. I think MOOCs are the "book clubs" of education at the moment. Probably there will be a bifurcation into general study group activities on the Internet (particularly for recent or esoteric topics) compared to more "certified" and "instructor-led" MOOCs that use the best of blended learning techniques but on a larger scale.